A break in the action. Hockey game, Chippawa Park rink, January 1 evening. On a clear day. River Road rink, awaiting blades of steel. After a nighttime snowfall. Niagara College campus from atop the berm. Lunch break on Merritt Island, March. Fishing at sunset on Gibson Lake, Thorold, June. Taize prayer at Pentecost, June, St. Kevin church. Gold medal presentation to Canadian team, World Dragonboat Championship, Welland International Flatwater Centre. A July sunrise, Welland International Flatwater course. Mist rising above the Flatwater course at sunrise. September sunset over Woodlawn Road. Pilgrims along the route, Notre Dame’s 40th anniversary Pilgrimage, October. Welland-Crowland War Memorial, Chippawa Park, November. And last but certainly not least, City of Welland rose, June, my garden. WELLAND – A compilation of my photos taken during 2015. May you have a Happy New Year blessed with peace, good health and happiness! This entry was posted in Uncategorized on December 31, 2015 by fromareportersnotebook. Significant freezing rain and strong easterly winds expected. A intense low pressure system from Texas will arrive over the Great Lakes tonight. A warm front associated with this low is producing a band of freezing rain which has already started in southwestern Ontario and will continue to move northeastwards this evening. Ice accumulation amounts could range from 5 to 10 mm. This could well be a significant freezing rain event as strong easterly winds of 40 gusting to 70 km/h will likely result in widespread power outages across many areas beginning this evening. Surfaces such as highways, roads, walkways and parking lots will become icy, slippery and hazardous. Be prepared to adjust your driving with changing road conditions. 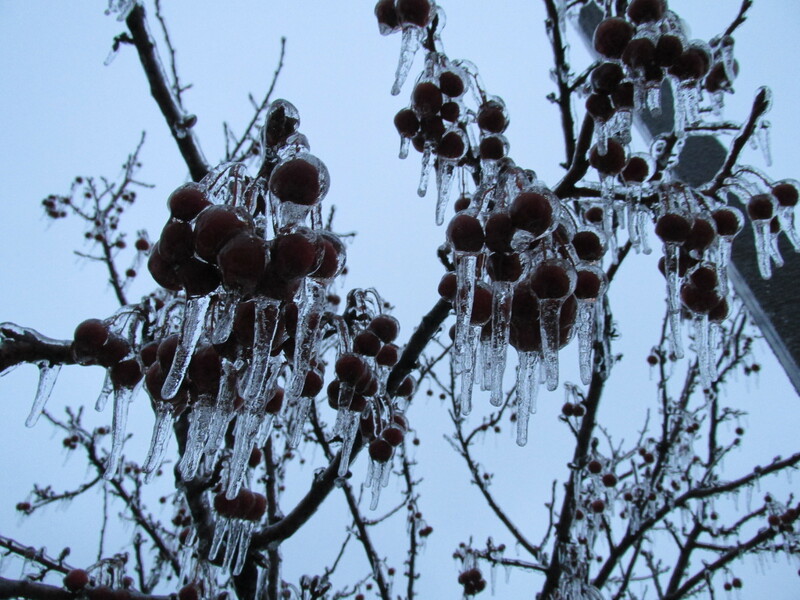 Beware of branches or electrical wires that could break under the weight of ice. Please continue to monitor alerts and forecasts issued by Environment Canada. To report severe weather, send an email to storm.ontario@ec.gc.ca or tweet reports to #ONStorm. This entry was posted in Uncategorized on December 28, 2015 by fromareportersnotebook. WELLAND – Municipal budget watchdogs should take note of two upcoming dates with relation to preparation of Welland’s 2016 budget. The dates (January 4 and January 11) are provided in a Notice that can be found on the city’s website, in the Keep Current drop down box, Public Meetings/Information Sessions. Take notice that the City of Welland Budget Review Committee will be holding an open meeting to obtain input from members of the public regarding the City’s 2016 Water and Wastewater Operating & Capital Budgets and 2017-2025 Capital Forecast. The meeting is scheduled for Monday, January 11, 2016, at 5:30 p.m. in City Council Chambers, 60 East Main Street, Welland. The following information will be available on Monday, January 4, 2016, at no cost, at the City of Welland, Finance Division, 60 East Main Street, Welland, Ontario, and can be downloaded here. The proposed date for the Council of the Corporation of the City of Welland to consider adoption of the 2016 Water/Wastewater Operating & Capital Budgets is January 26, 2016. Any person who attends has the opportunity to make a presentation with respect to the 2016 Water and Wastewater Operating and Capital Budgets and 2017-2025 Capital Forecast. For recordkeeping purposes, a copy of your presentation is to be submitted to the Clerk at the meeting. In order for the Committee to hear from as many residents as possible, presentations are limited to 10 minutes per presenter. Freezing rain and strong easterly winds expected. A intense low pressure system from Texas is arriving over the Great Lakes tonight. A warm front associated with this low will produce a band of freezing rain which is expected to start in London and Sarnia by 4 pm and continue to move northeastwards this evening. Ice build-up due to freezing rain is expected or occurring. A Texas Low is expected to make its way towards the Great Lakes today. A warm front associated with this low will produce a band of freezing rain which is expected to impact Windsor near noon, London and Sarnia by 4 pm and continue to move northeastwards this evening. This could well be a significant freezing rain event as strong easterly winds of 40 gusting to 70 km/h will likely result in widespread power outages across several areas beginning this evening. Surfaces such as highways, roads, walkways and parking lots will become icy, slippery and hazardous. Beware of branches or electrical wires that could break under the weight of ice. A storm from Texas will cause snow, ice pellets, and blowing snow to develop Monday afternoon then change quickly to freezing rain by Monday evening. The freezing rain may persist several hours before changing to rain overnight. Strong easterly winds gusting to 70 to 80 km/h are also expected Monday evening. Poor travel conditions will develop Monday afternoon and continue into Monday night. The freezing rain combined with the wind could give the potential for power outages Monday evening. Conditions will improve early Tuesday. This is Chambers’ Corner ….. the occasional occupant of a corner of this blog, where Bob Chambers, an Evening Tribune photographer from 1957 to 1970, will present some of his photographs from that era …… Readers are asked to please comment! I never thought that this picture I took at Welland’s Chippawa Park pond on January 10, 1962, would lead to where it has. When former Wellander Rob Paola, now a big-time Environment Canada weather guru out on the Prairies, where they know a few things about weather, blogged about how cold it actually was on that day 53 years ago, I surely didn’t see it leading me to a very warm Christmas shortly after I was born. But, when Rob sent us a link to all the temperatures ever recorded at every major site in Canada since 1872, it struck me that I might find the verification of a story told by my parents as long as I can remember. They surely remembered the date, Christmas 1940, with accuracy, as my mother was pregnant with my sister Norma, who was born just 29 days later. The detail that they remembered was, on that Christmas day it was so warm, that they had many windows open in the house …… as most of the big windows in our house in Sherkston faced south, and the low, warm December sun, came streaming in. Would Rob’s link verify this tale? Indeed. Christmas Day, 1940, was the second warmest on record (60F), with the warmest (just 62F) being way back in 1895. Now these are Welland temps, but with Sherkston being about 10 miles away as the crow flies, an accurate measure too because some of it is over Crowland, they’re corroborated by Buffalo temps, barely a dozen miles east, being within a degree. This year’s Green Christmas, enjoyed by all of us, didn’t even come close (high temp in Welland Christmas day 2015 was 46.4F) to that 1940 high. When she grew up Norma became a primary grades teacher and had a huge connection with Welland where she lived, while teaching for the Niagara South Board of Education. She was at both Darby Road School and McKenny School when they were closed forever. Then at Afton and Princess Elizabeth (where she spent Friday and Saturday night during the Blizzard of ’77), before finishing her career at Cooks Mills. Often when shopping in Welland, former students would come up to talk to Miss Chambers. Thanks to Rob Paola for bringing all this back to me. Your comments are invited and appreciated by the photographer/author. This entry was posted in Uncategorized on December 27, 2015 by fromareportersnotebook.